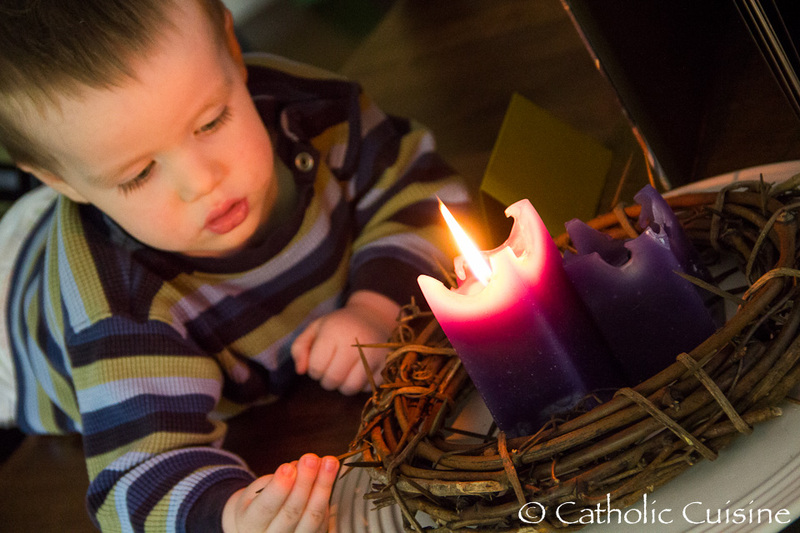 Today is a historic day in the Catholic Church as two popes are canonized. 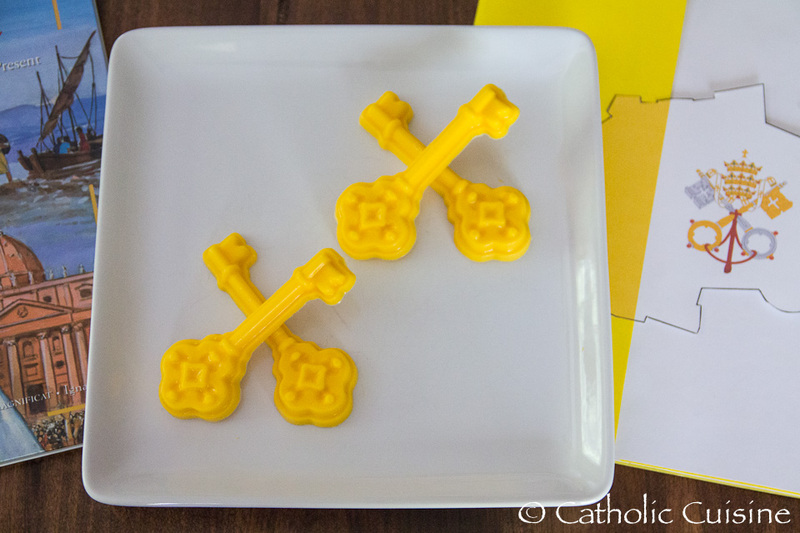 You can find a number of recipes to commemorate these new saints in the archives including Papal Polenta, Kremówka Papieska (Papal Cream Cake), and John Paul II Sugar Cookies. 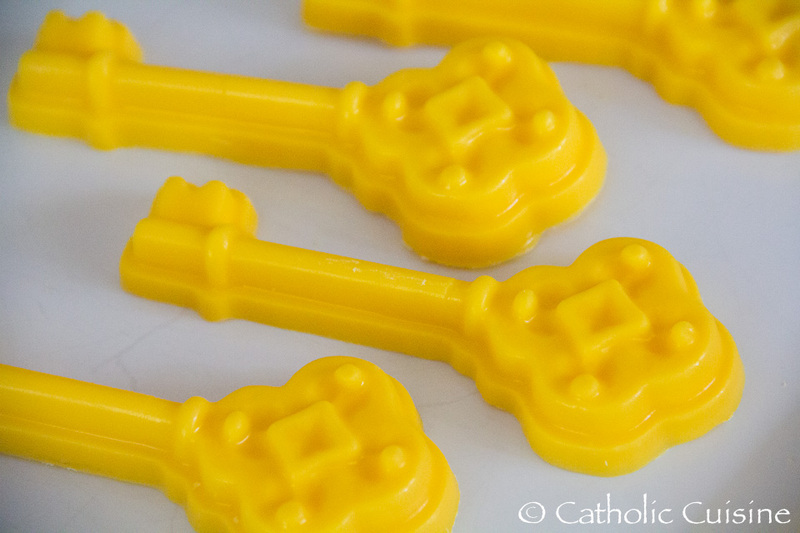 I just finished making some "Keys of Heaven" candies for my children using this Key Mold and Yellow Candy Melts. 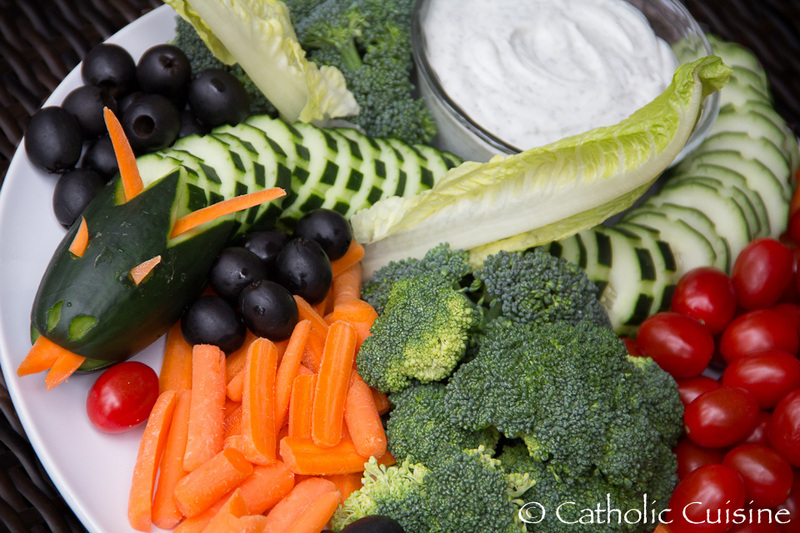 With the feast of St. George falling on Easter Wednesday this year, following a weekend filled with Easter and Birthday cakes in our home, I decided to make a Veggie Platter for the feast of St. George instead of a dragon cake or our Saint George Cookies. 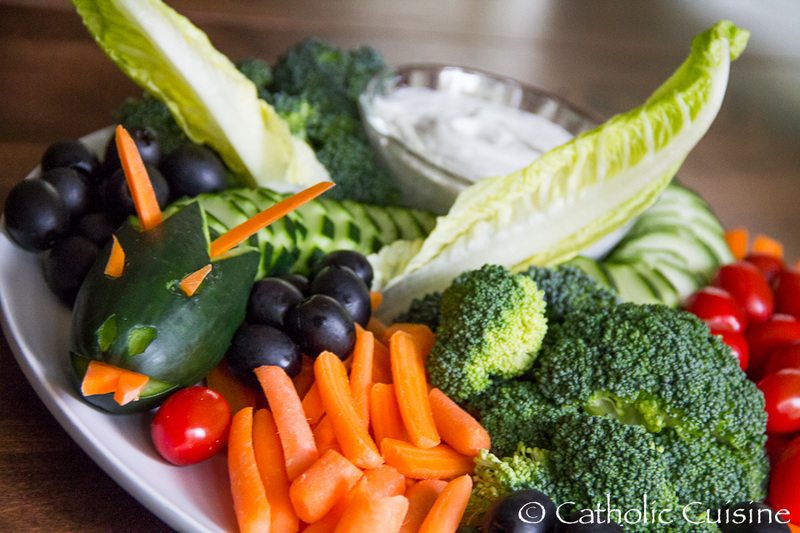 Our veggie platter was inspired by a couple snake themed veggie trays I found through a google image search, with the addition of some lettuce wings at the suggestion of Charlotte's oldest son. 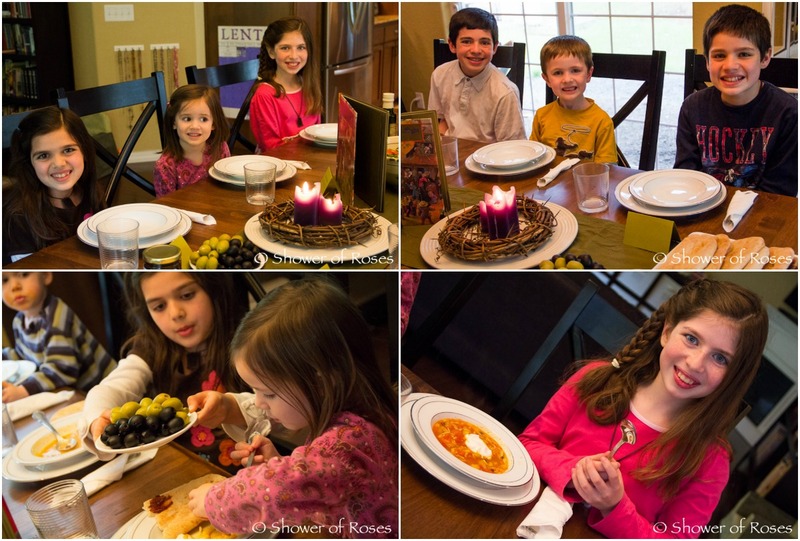 I thought it turned out great and my children love it! 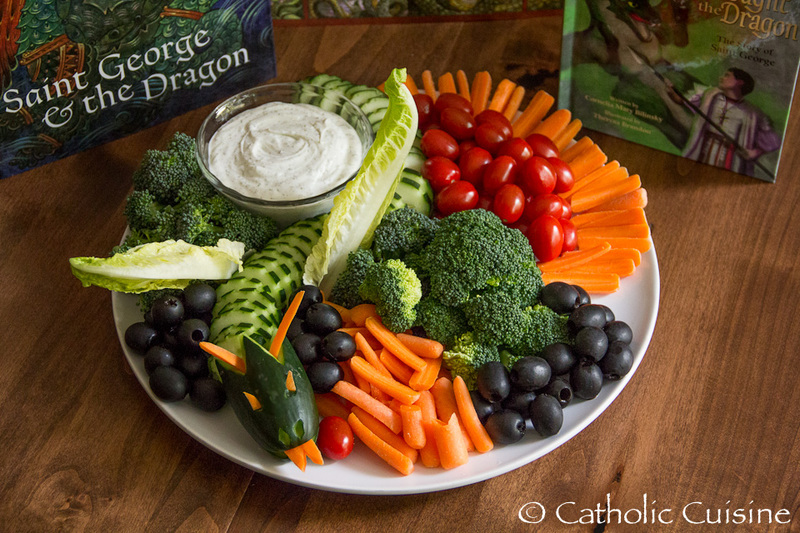 We will devour the dragon this evening with dinner, after reading a couple new books (Saint George & the Dragon by Jim Forrest and The Saint Who Fought the Dragon: The Story of St. George - affiliate links) that one of our boys discovered in his Easter Basket! 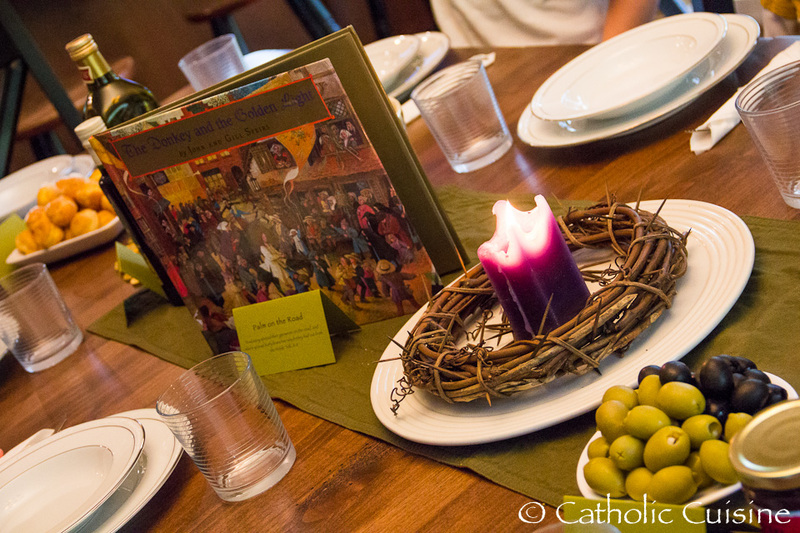 You can also read The Ballad of St. George by Eliana Murphy over at Shower of Roses. 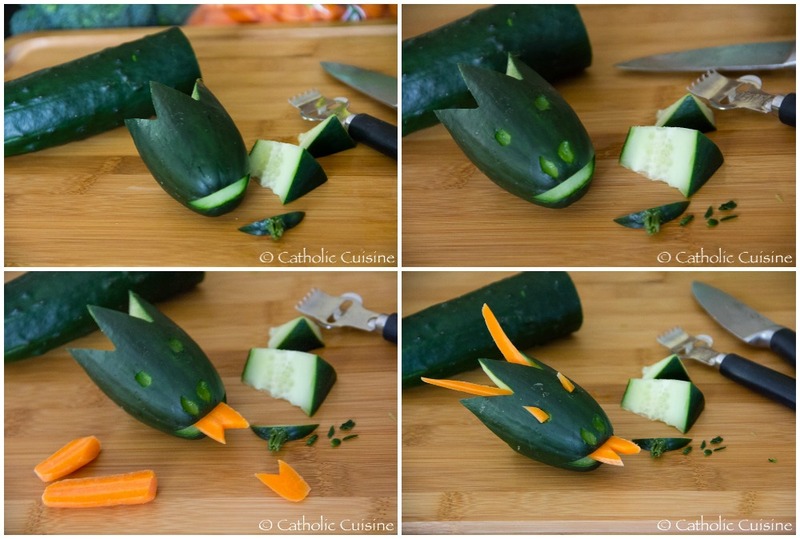 Using the end of one of the cucumbers and some carrot slices, create a dragon head. 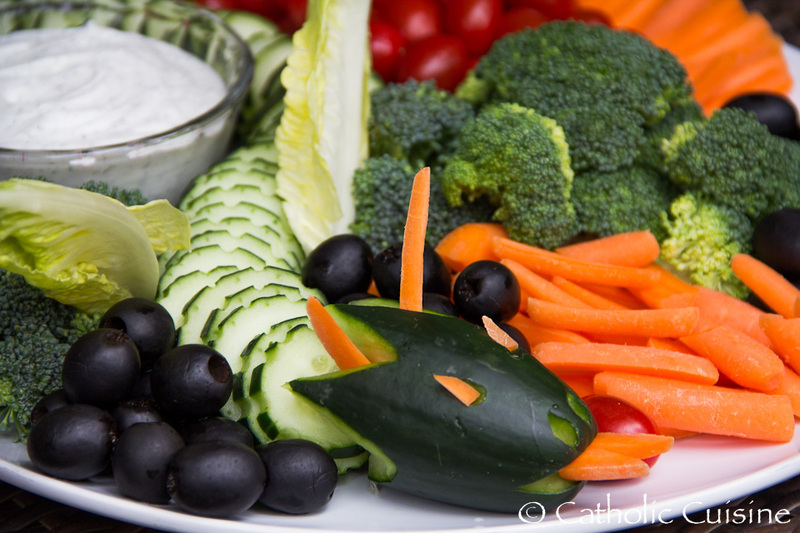 Slice the rest of the cucumbers and shape into a body on a platter, wrapping around the dip bowl. 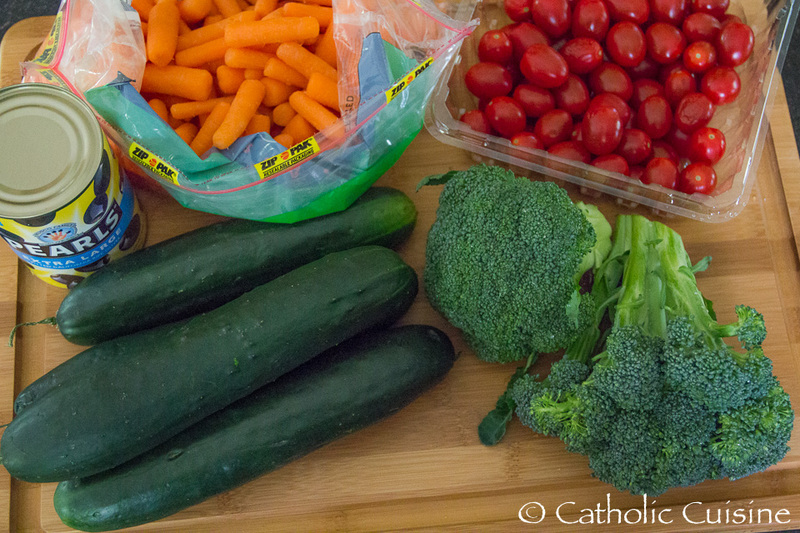 Add the broccoli, carrots, tomatoes and olives, along with the two leaves of lettuce for the wings. Like I did a couple years ago, I decided to add another book to our collection for this menu item. 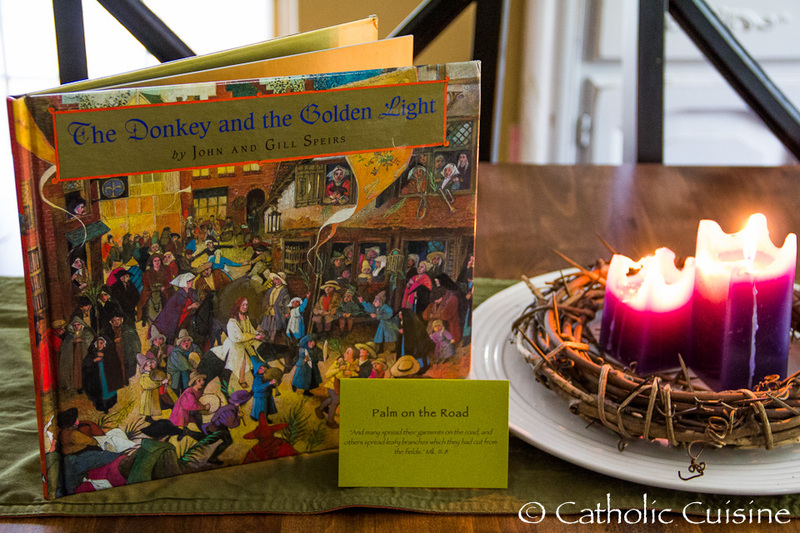 When I ran across a bargain priced version of The Donkey and the Golden Light I thought it would be perfect for this year. 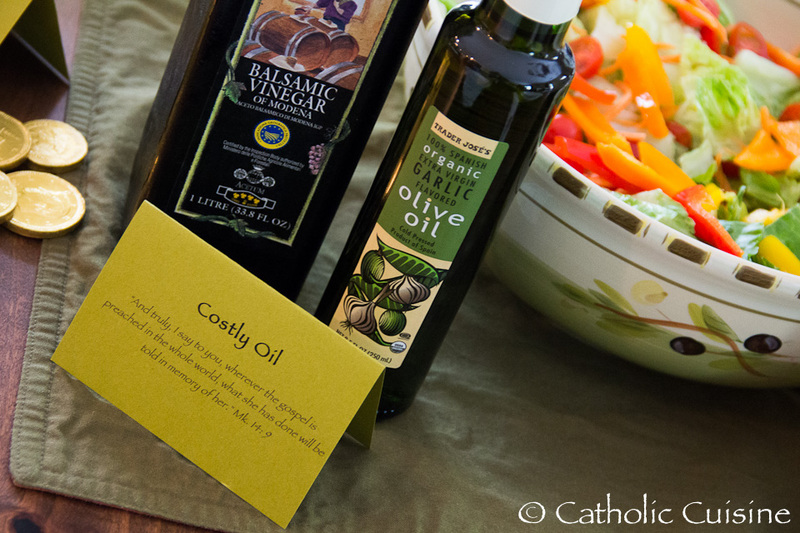 One of the boys made a salad and I pulled out the vinegar and some "costly oil" to use as dressing. 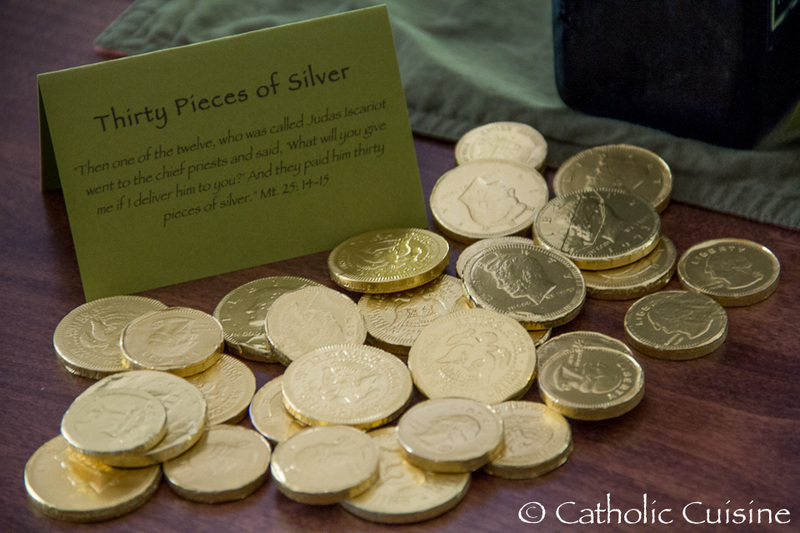 I happened to have 30 Chocolate Coins left over from St. Patrick's Day so I used these for our "silver" this year. 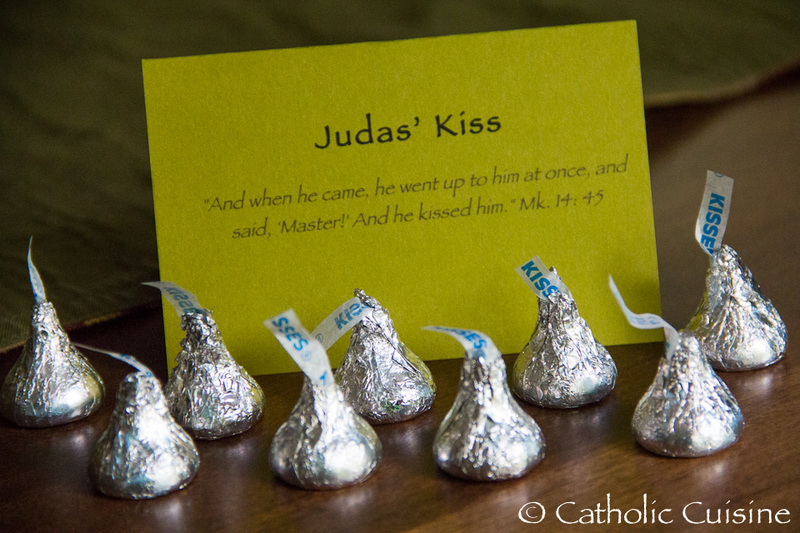 Only a few of the children gave up candy this year so those few are saving their few coins (and Hershey Kiss) for Easter and put another sacrifice bean in the jar. 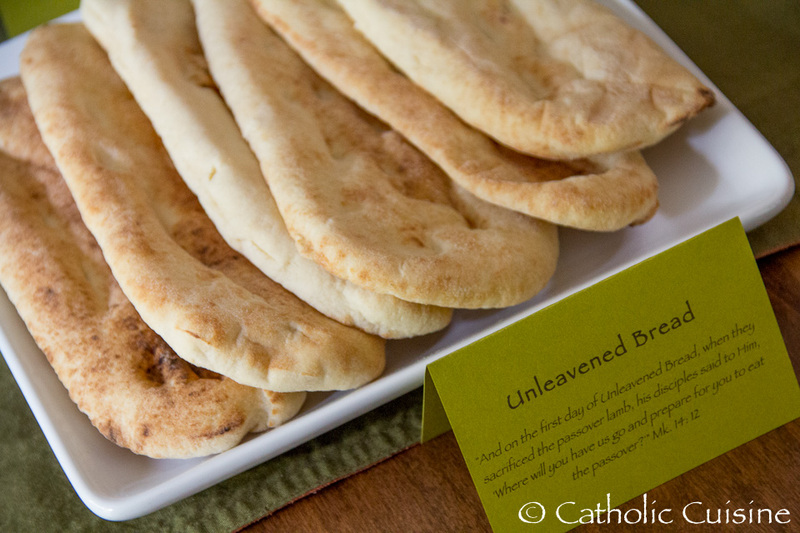 I kept it extra simple this year and picked up a package of Naan since my husband loves it, although technically it is a leavened bread... Don't tell the kids! 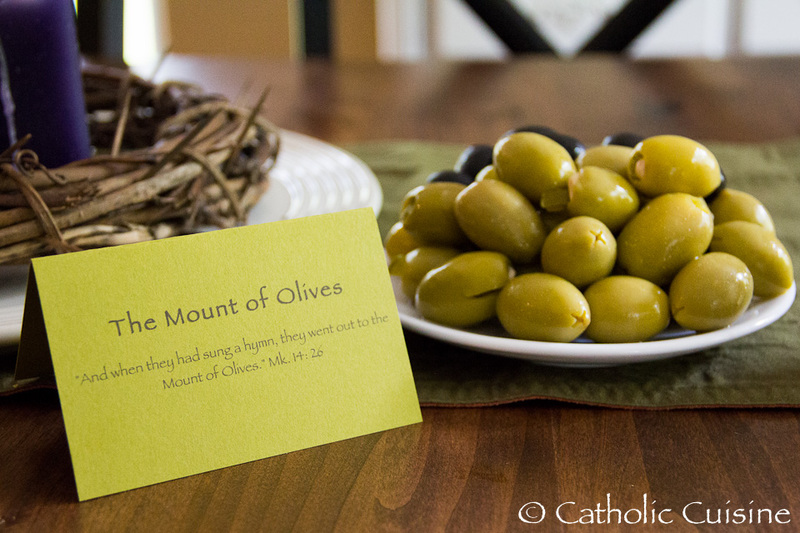 It was perfect for with either the Chicken Curry Soup or the Fig Butter. This year we had Chicken Curry Soup and Baked Chicken. 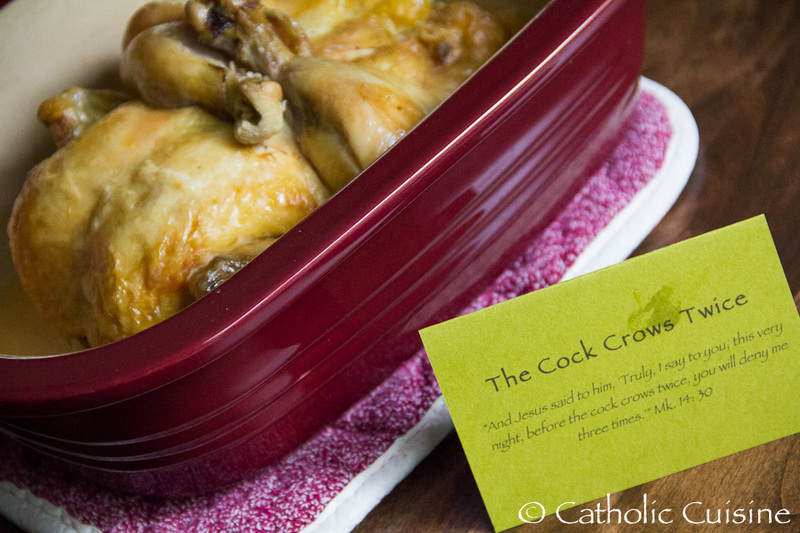 "Mom, did you just put the chicken in the baking pan so that it looks like it is homemade?! Genius!!" Um, no. I put it in the pan so that I could heat it up! ;) And I should have washed and dried my hands before touching the little sign with my greasy fingers... 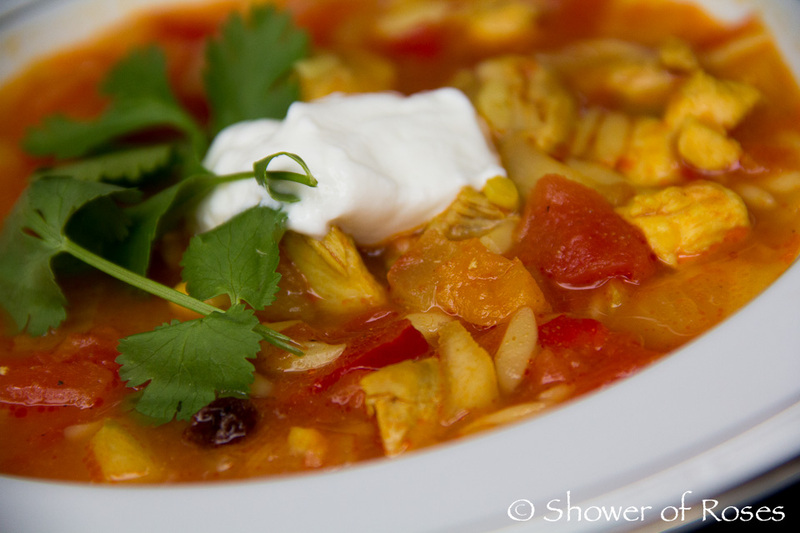 The Chicken Curry Soup was homemade though, using my mom's recipe. YUM!!! 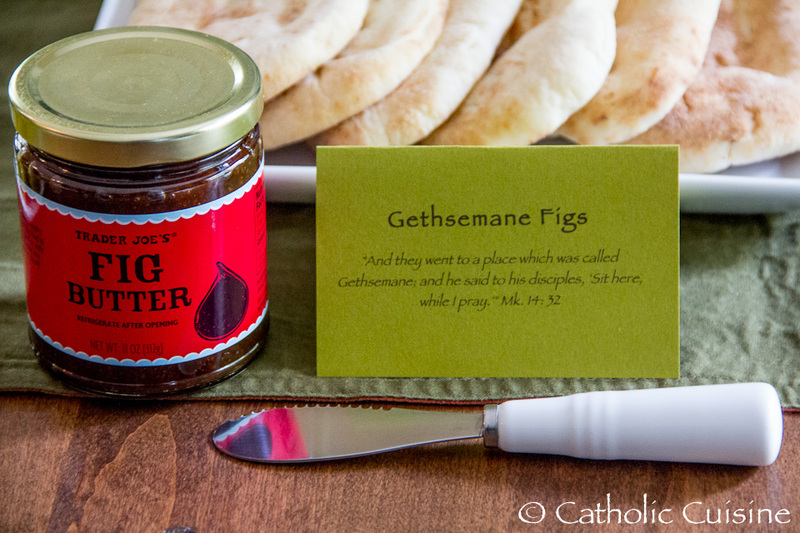 Fig Butter representing Gethsemane Figs to spread on the "unleavened bread." 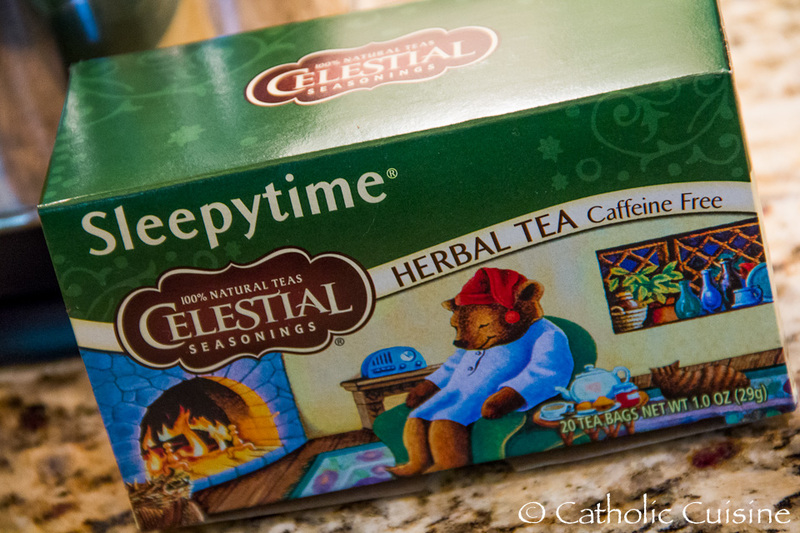 Not all of the children like herbal tea, but a few of us enjoyed some Sleepytime Tea after dinner. Thanks again Jennifer for the suggestion! 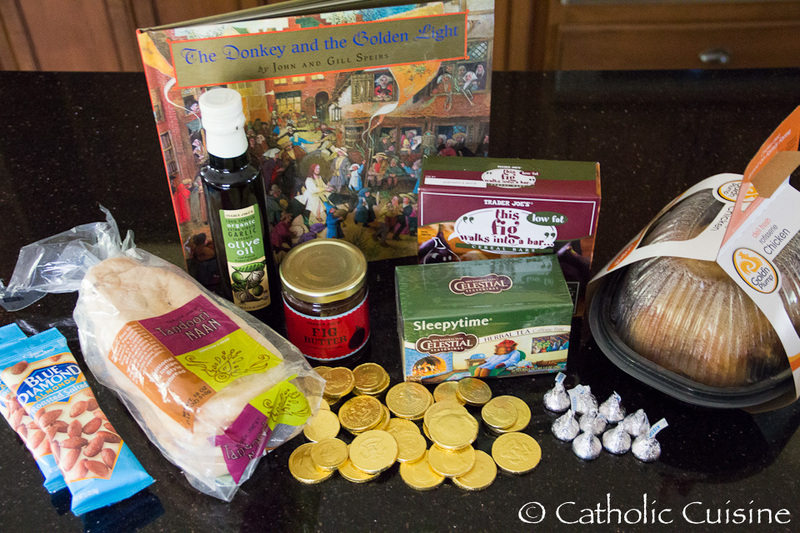 Since we were traveling on the solemnity of St. Joseph this year I still had a package of Cream Puffs in the freezer that I had purchased for our annual feast day celebration. 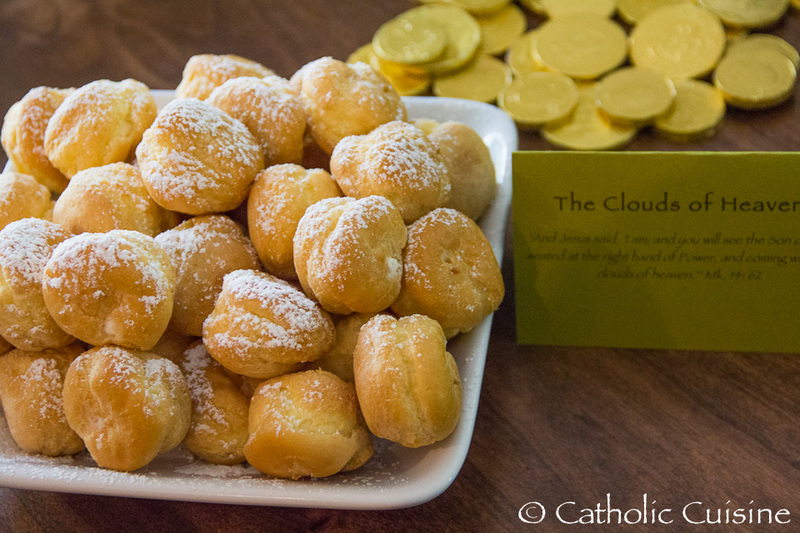 They made perfect little "Clouds of Heaven" for our Holy Thursday Dinner. 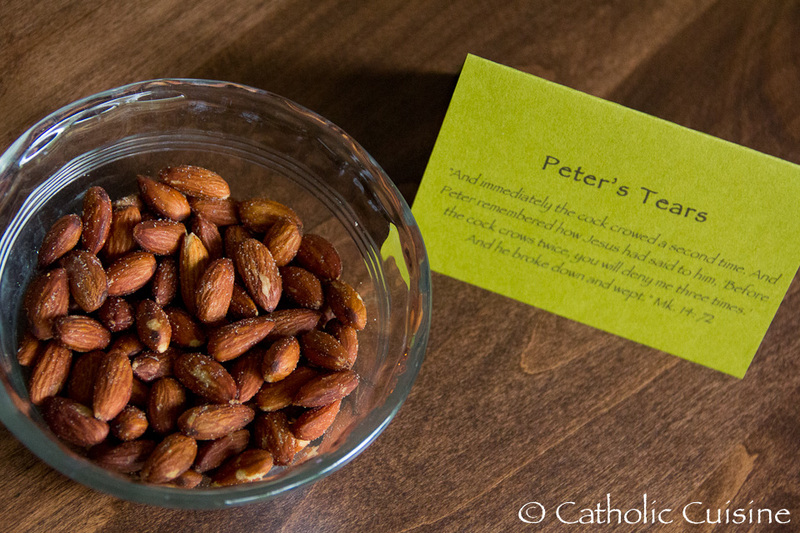 Roasted and Salted Almonds were perfect for Peter's Salty Tears.